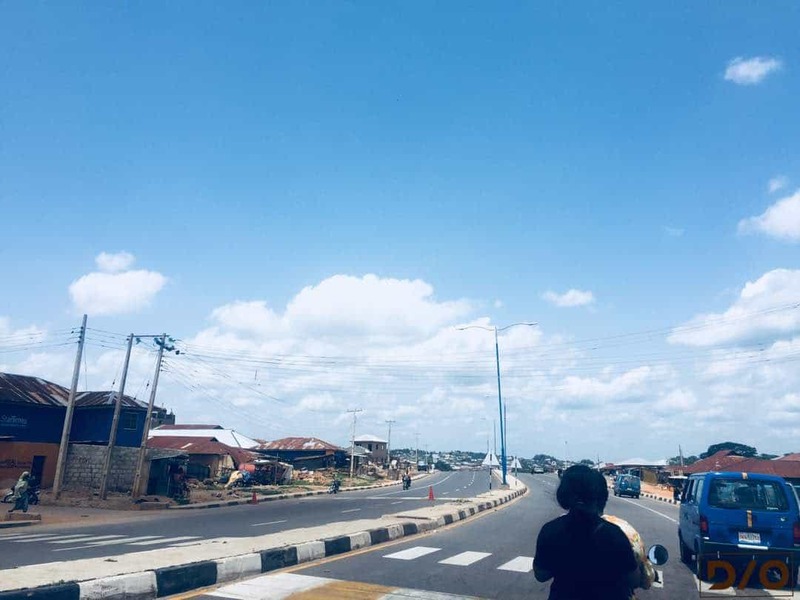 I finally made it to my 12th state for my journey on visiting 25 nigerian states before I turn 25! This time I visited the Land of Virtue popularly known as Osun state, located in the Western part of Nigeria and truly there are gems in this state. After planning this trip for a while myself and friend;Belema who is a Youtuber and writer left Lagos and boarded a minibus to Osogbo from the OjotaPark. In two hours we were in Osun state and in an extra hour we arrived the capital! Did you know that the name Osun comes from a river that flows through the state? Thanks to my friend Okizle( whom I met on Twitter, the power of social media ), he gave us proper directions on how to make our way around and we headed for the Osun Sacred grove as soon as we arrived Osogbo. 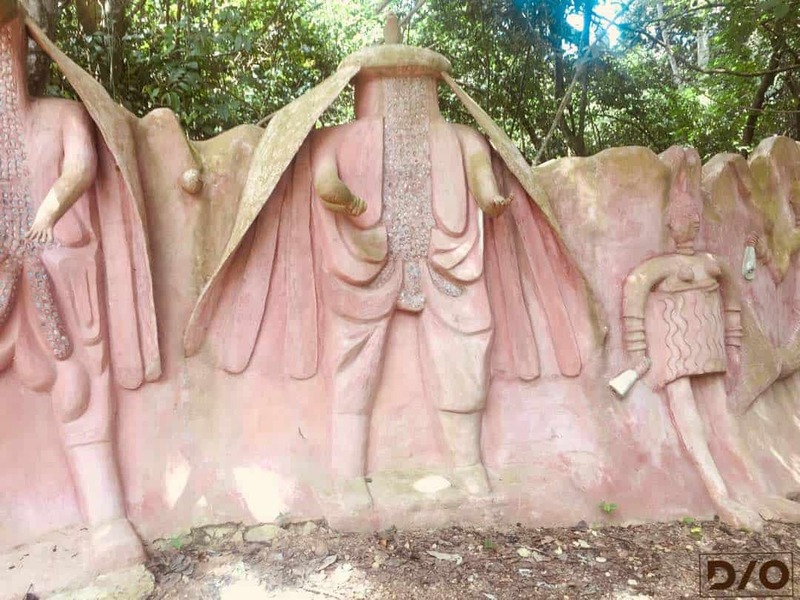 The Osun sacred grove was declared as a UNESCO( United Nations Educational, Scientific and Cultural Organisation ) World Heritage site in 2005 which was formed over 400 years ago and is regarded as the home of the Oshun goddess which still remains a place of worship for her devotees. On arrival, we were asked to pay 200naira each and 1000naira for phone photography while 3000naira if we were using a professional camera Lol! I was shocked. (P.S: These prices are at the time of my visit) We were assigned a tour guide who actually did a great job! 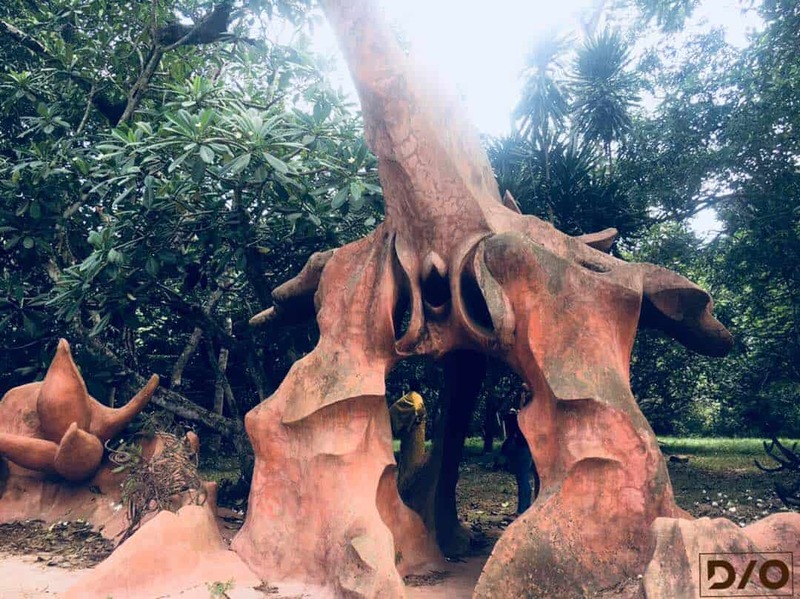 As we entered the Osun sacred grove, the tour guide gave us the history of how the groove came about. The grove which was found by a hunter while clearing the bush for farming. 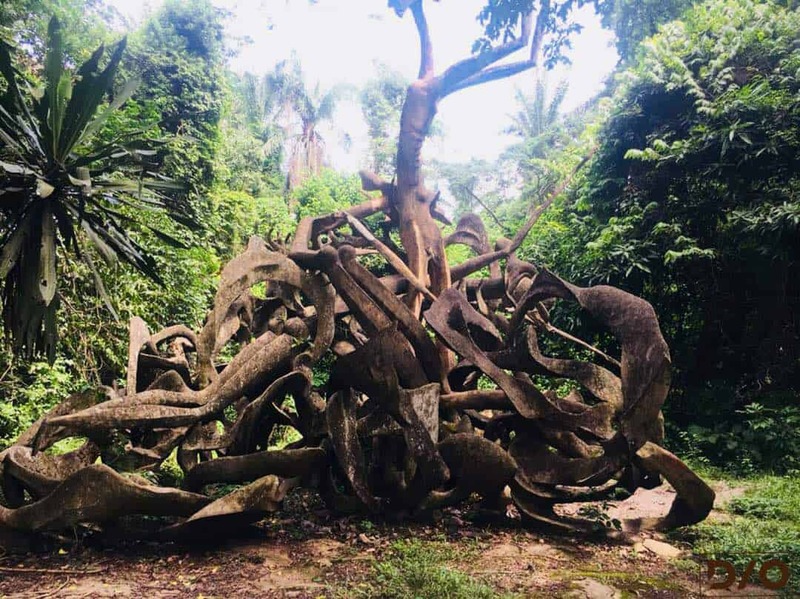 In the process, one of the trees fell on the dye pots of Osun and a loud voice came from the river shouting that the dye pots has been broken. 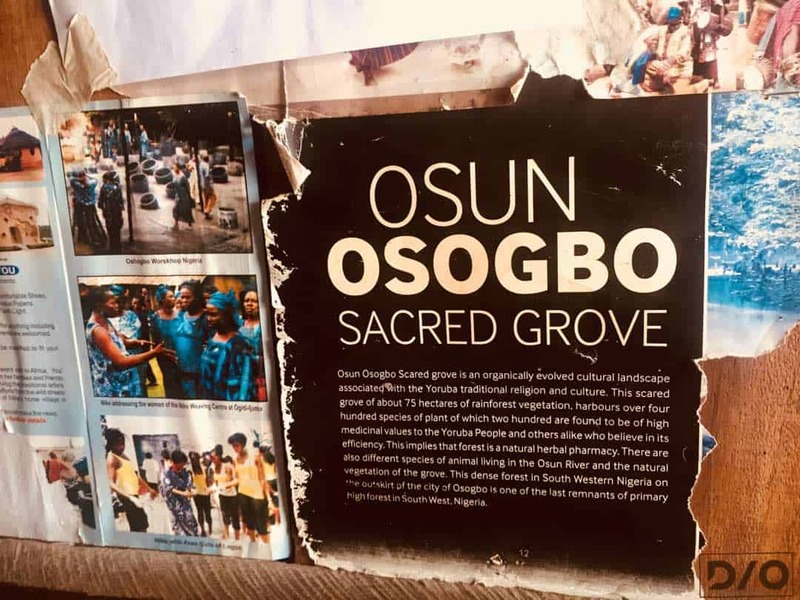 Due to that, an agreement was made with the goddess that for the people to settle down there and get blessings and prosperity they must hold a festival every year which is known as the Osun Osogbo Festival Held in August of every year. -The above image is the entrance which the Arugba enters from during the grand finale of the festival. The Arugba who must be a virgin from a royal family carries the calabash in the company of the devotees of the groove. Our tour guide told us there is a sacred path inside which leads to the Osun courtyard. 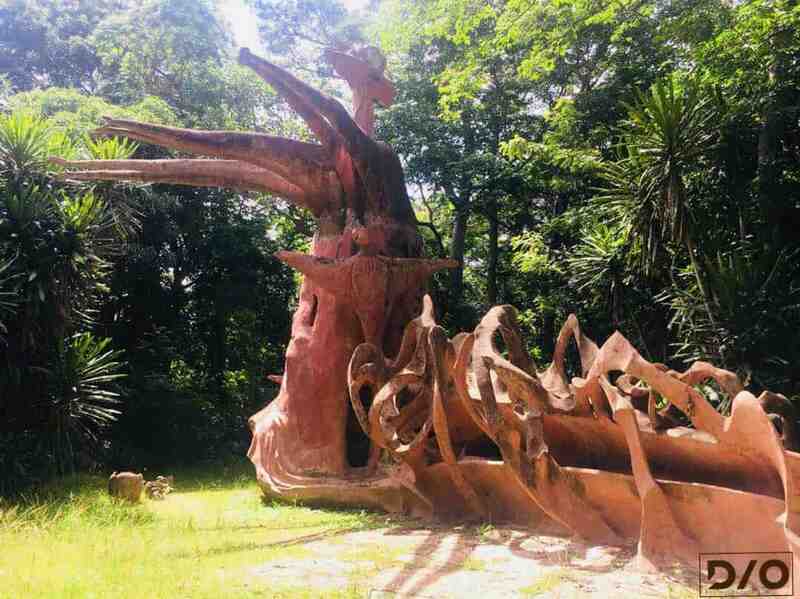 The place is called the Arugbagba bypass or Yemoo House(Yemoo was the wife of Obatala). The entrance to the next point we saw is known as the Arch of the flying Tortoise. The Arch of the Flying Tortoise! 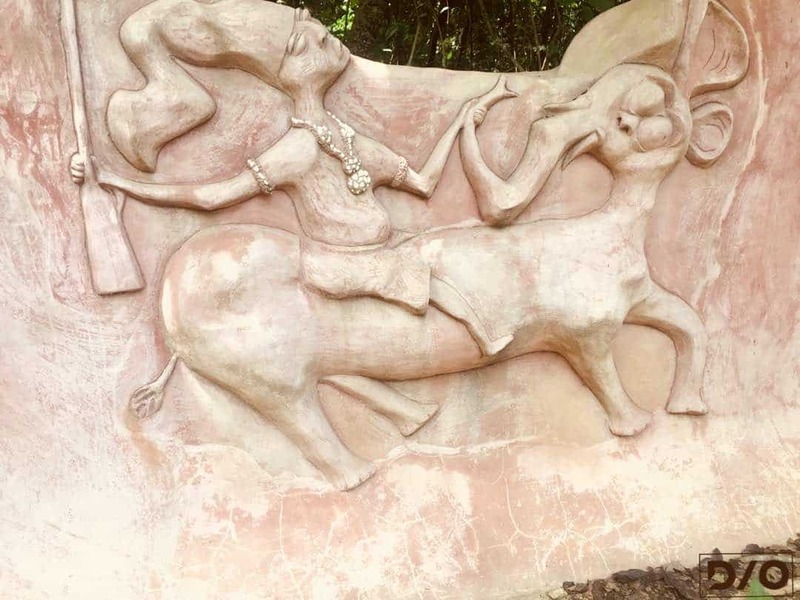 On entering through the arch of the flying tortoise, we were welcomed by various sculptures at the grove. We met some devotees of the Osun goddess and the chief in charge there and we were shown the Osun river where the goddess comes out from. During the festival, her devotees see her while they offer sacrifices to her. We were informed that she comes out as half-human and half-fish. Her devotees’ arent only Nigerians, they are spread all over the world and all gather together for the yearly Osun Osogbo festival. 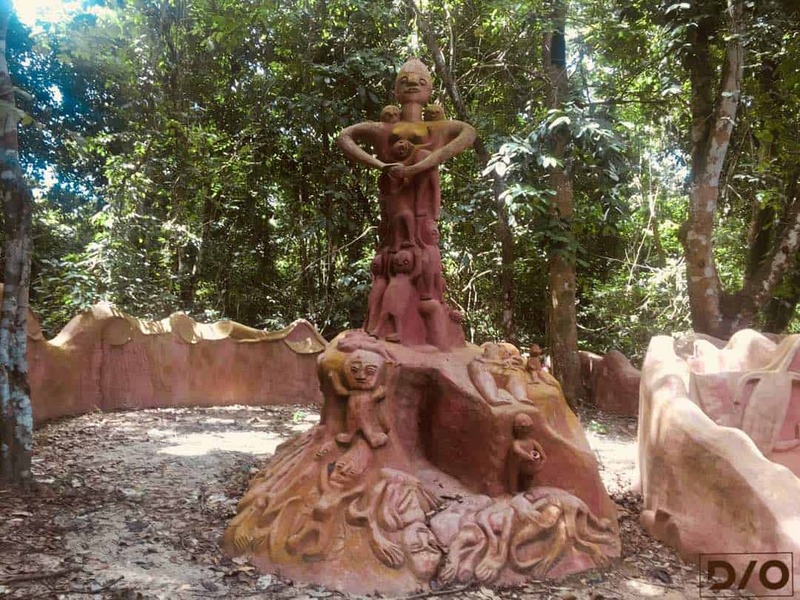 The custodian and priestess of this grove was a German-born devotee of the Osun deity, Susan Wenger, popularly called “Aduni Olorisa” who passed away in 2009. 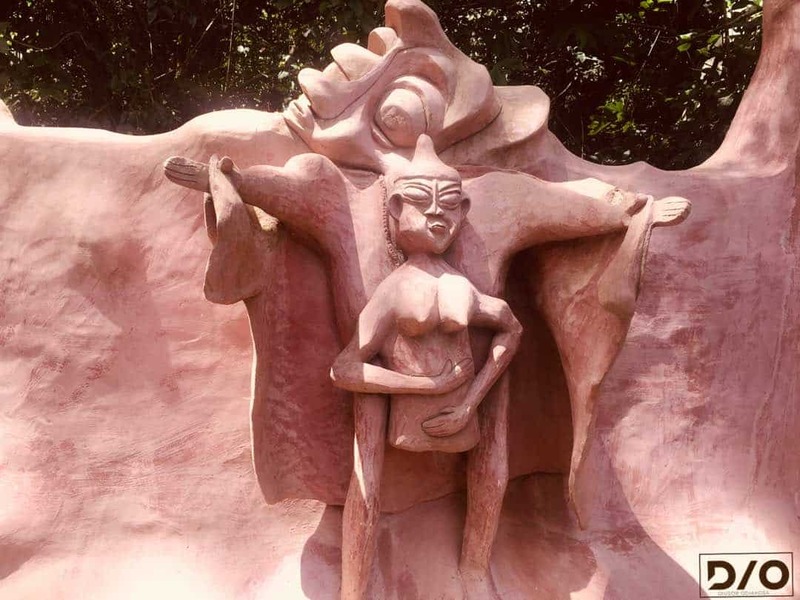 It is worthy to note that the sculptures that are placed at the Osun sacred grove were created by her followers and local artists. 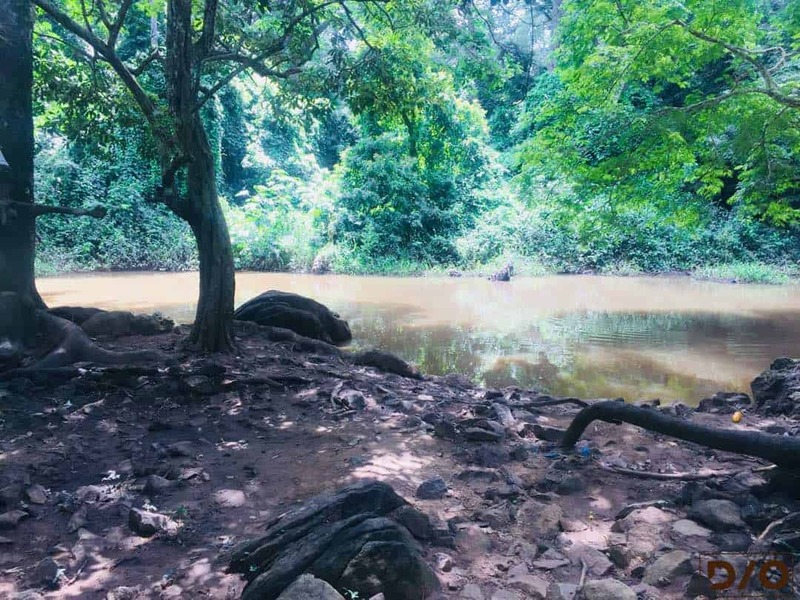 The Osun River spans across all the major points at the grove and is believed to have healing, protective and fertility powers as her devotees take water from the river during the Festival. -This bridge which is over the Osun river was commissioned in 1935 and is still standing till date. The Sculpture of the Chameleon! 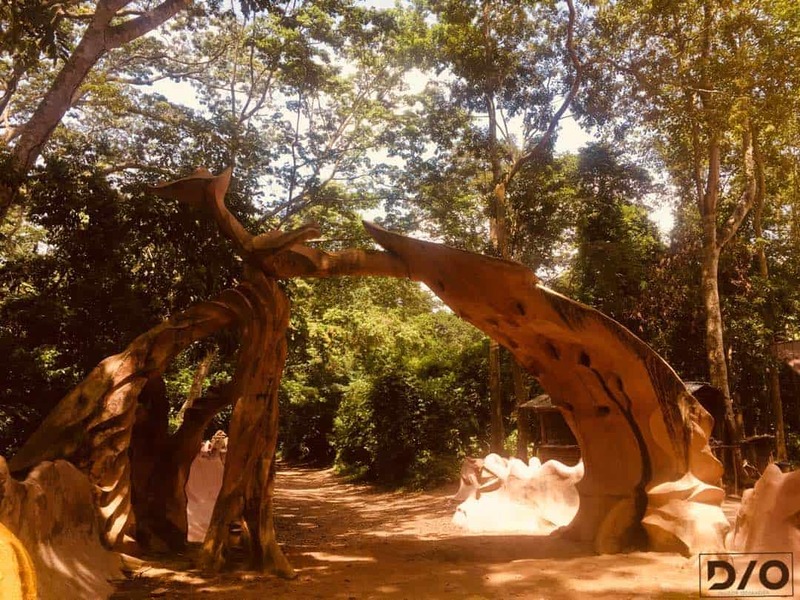 We moved over to another section of the sacred grove and the main entrance for this side was a sculpture of a Chameleon. which was used to call for rain when needed, and as expected for a chameleon; it changes colours. 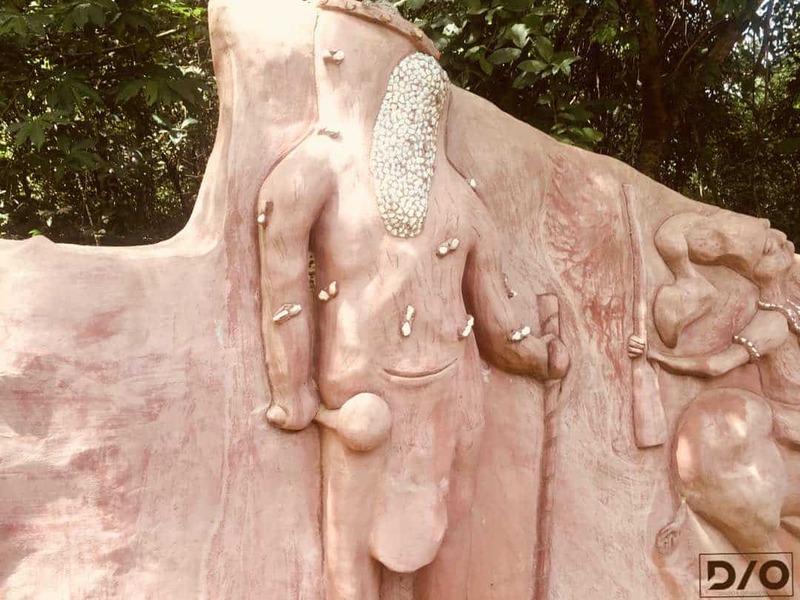 Alagere, Oba Lowaye – the god of healing (mainly for chickenpox and smallpox). The above image shows people lying to prostrate before him asking for healing. There is so much history behind the grove which was quite enlightening for me. We left the groove and went straight to our hotel, afterwards we had Amala(Native Yoruba’s Meal) for Dinner and this ended our first day in Osun State. Belema made an interesting video about our first day which you can watch here. 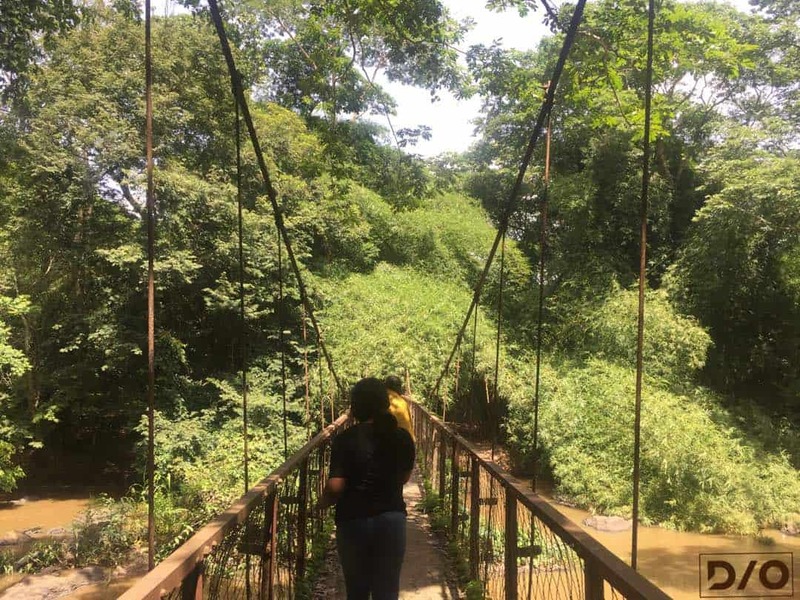 I shared my experience at the Nike Arts Centre and the Olumirin/Erin Ijesha Waterfalls also in Osun state which I shared here and here. 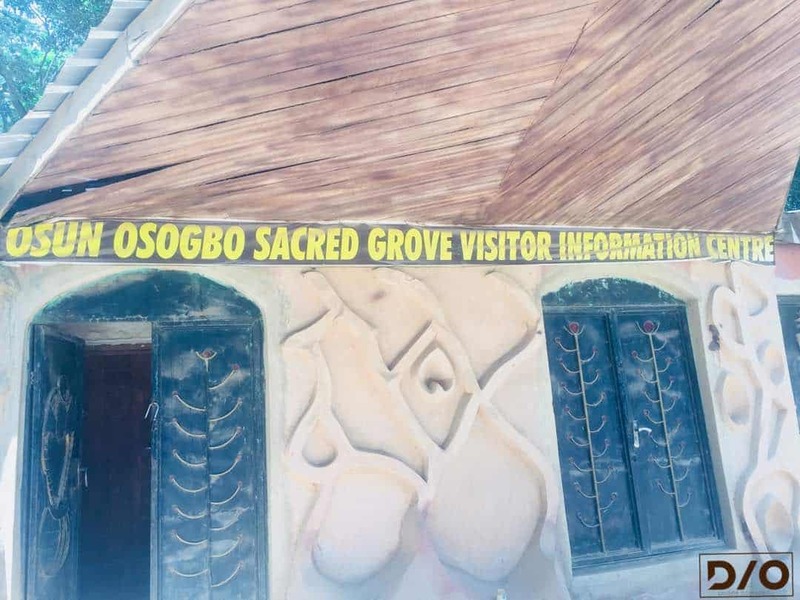 Have you been to Osun Sacred groove or Osun state? What was your experience like? If you haven’t let me know if you would like to visit here soon. Please share your thoughts with me in the comments section below! The place looks scary and welcoming at the same time. I just want to meet that fertility god and be like yo mam twins please. Boy like David Beckham Girl like Genevieve. Thank you for giving me an insight of the place. 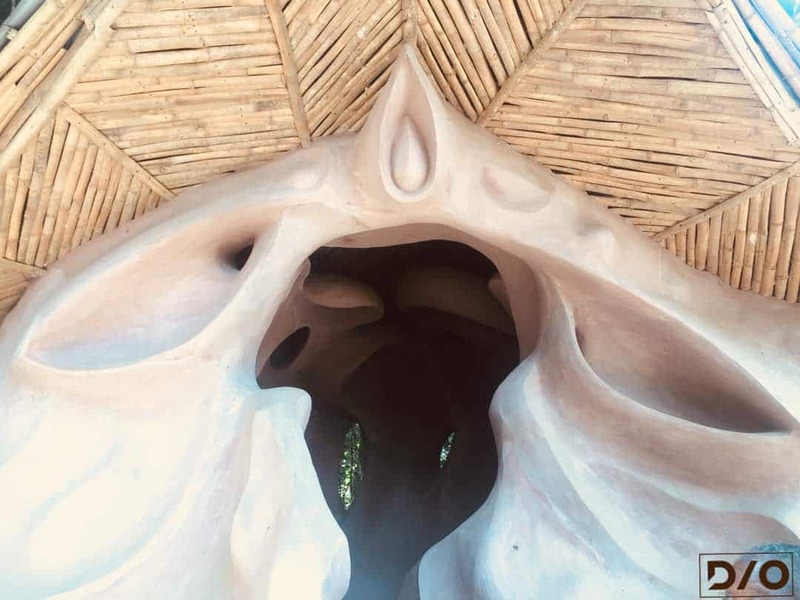 Sure you would like it when you visit! Many more to come for us😊. Thanks a lot! This was a great read dear, I am not sure if I am eager to visit this place because of how creepy it looks. I’ve been to Osun state before but I only went to the water fall, I’ve never been to the groove. This post is quite enlightening, but the 3k for camera is shocking haba that’s pure exhortation. Thanks a lot dear😊. More to come for us! 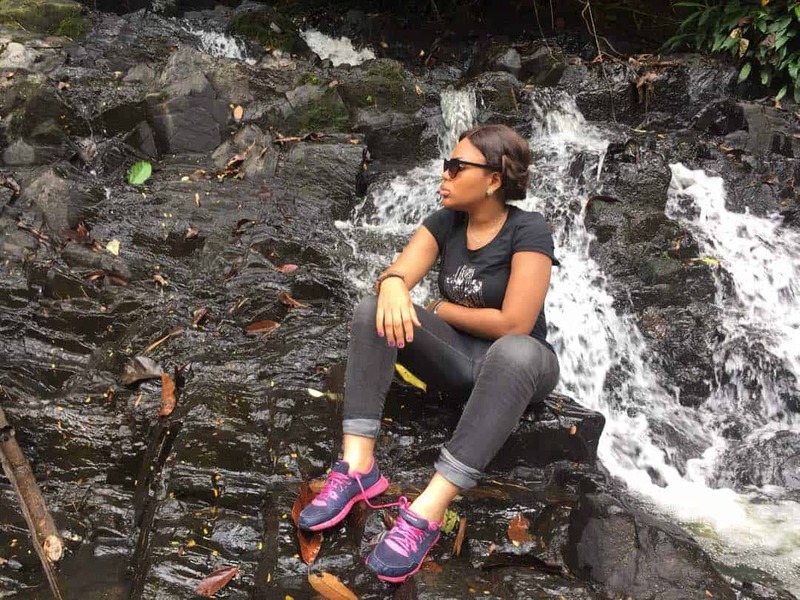 Visited the state on a short trip, wasn’t opportuned to visit the Grove, but I visited the Erin-Ijesha waterfall and few attractions. I will definitely check this place out when next I visit Osun state. Nice write up Diusor. First, Congratulations on your 12th state. Go girl! Keep inspiring. Thank you so much, darling. I really appreciate!